The surroundings are quiet and rural - and yet close to most: Koege 10 minutes, Copenhagen 45 minutes and 30 minutes to Roskilde by car. Short distance to the bus directly to Koege center. The ideal place for a romantic week-end, for business persons, bicycle tourists and families who enjoy beautiful surroundings. Here is an opportunity for relaxing walks in the park surrounding Vallø Slot, follow Tryggevaelde river or run, cycle or perhaps playing golf on one of the two nearby golf courses. Hello. 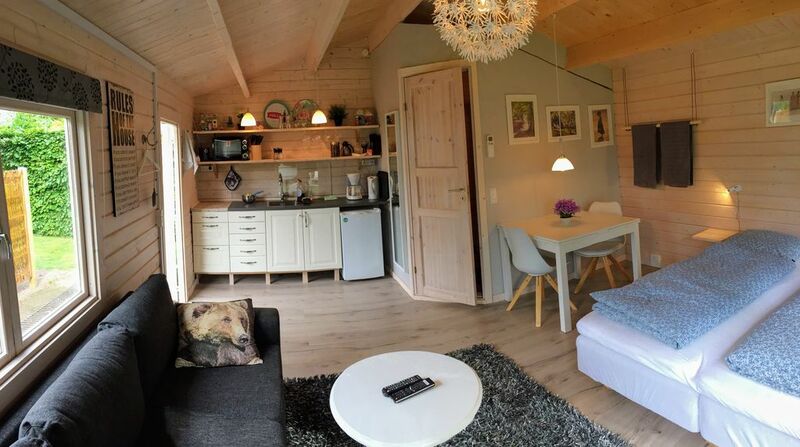 I have a little bed and breakfast with my wife located about 45 km south of Copenhagen. We live in a little village called Valløby, 7 Km south of Køge, far away from noisy traffic and hassle. Here you find a lovely garden with deck chairs and a hammock in witch you can relax. We have 2 rooms (shared bath and toilet) and a lodge (private bath and toilet). One room is with a double bed and the other is with 2 beds separated in the same room and of course extra beds if needed for a room. The lodge is located in the corner of the garden and is fully equipped with private kitchen, toilet and shower and all you need for a comfortable stay. In the main building we have a kitchenette where you find a microvawe-oven and a boiling kettle. You are NOT able to prepare a full meal on a stove with pots and pans. It's just for making coffee / tea or heating an already made meal. Of course we have free Wi-Fi in all the rooms, also covering the garden area. We have german TV channels beside danish, swedish and norwegian. Chromecast also avaliable. Breakfast is NOT included in the price. Wi-fi and Chromecast for HBO or Netflix or other streaming services. Ich habe mehrere Tage mit einer Freundin dort verbracht. Good to hear you had a nice stay.